The Gibb Brothers were born in England but grew up in Australia where they formed their first band. They were originally a band as Robin, Barry, and Maurice Gibb were joined by guitarist Vince Melouney and drummer Colin Peterson. Melouney left the group in December of 1968 abd Peterson in August of 1969. The Bee Gees returned to England in 1967 and signed with the Atco label in The United States. 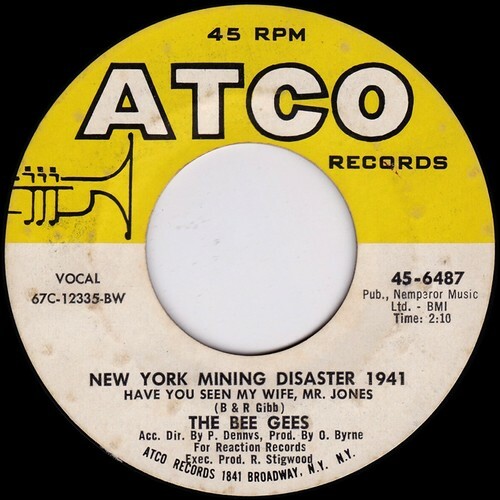 They immediately had chart success with the single “New York Mining Disaster 1941 (Have You Seen My Wife Mr. Jones)/I Can’t See Nobody.” It first reached the BILLBOARD MAGAZINE Pop Singles Chart May 27, 1967, and ultimately peaked at number 14. 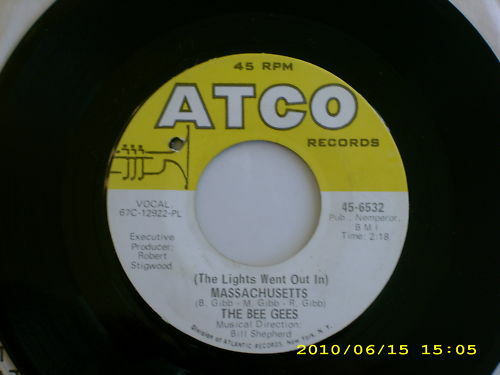 This was one of my favorite pre-Saturday Night Fever singles by The Bee Gees. “New York Mining Disaster” was very different from most of their material as it told a story. “I Can’t See Nobody” was an early example of what would become traditional Bee Gees harmonies. 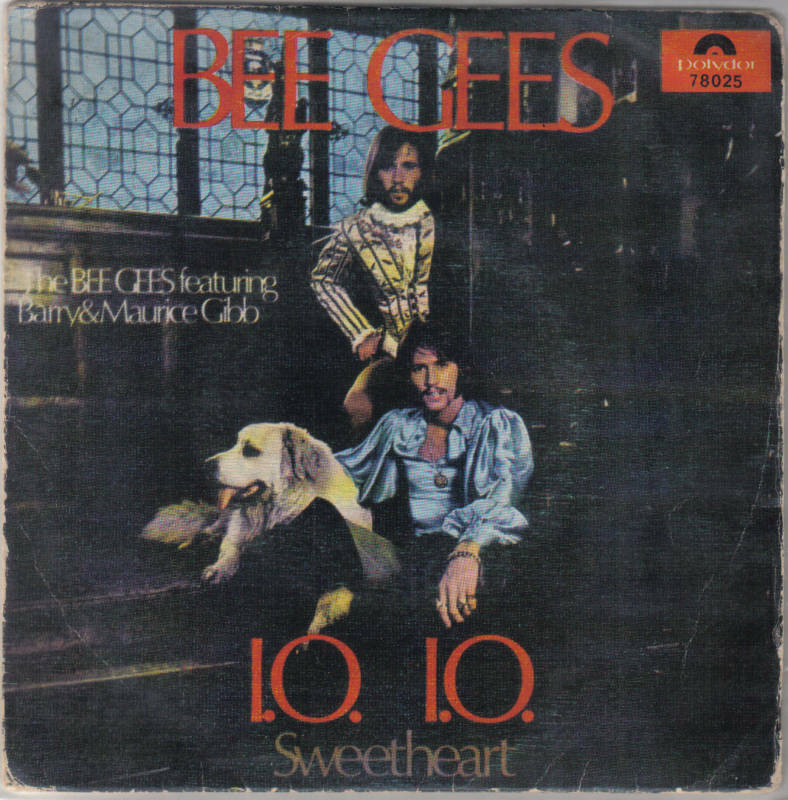 This was the firat of 41 singles The Bee Gees would place on the United States Singles Charts, including nine which reached number one. As time passes, many people forget just how popular The Bee Gees were during the 1960s and particularly the 1970s. The have sold in excess of 200 million albums worldwide and have had 41 singles reach the Billboard Pop Singles Chart in the United States, including nine which reached Number One. Barry, Maurice, and Robin Gibb began playing together in the late 1950s and by the early 1960s had formed The Bee Gees. They performed and recorded regularly until Maurice’s death in 2003. Surviving brothers, Barry and Robin, resurrected the Bee Gees name in 2009 in order to perform together. Brothers Robin and Barry have issued a number of solo albums down through the years. During the summer of 2009, Robin and his backing band pulled into the concert grounds of Ledreborg Castle in Denmark for a performance. Also on hand was the Danish National Concert Orchestra. That concert will soon be released on DVD as Robin Gibb In Concert with The Danish National Concert Orchestra. The 17-song set combines some of Robin’s solo songs, such as “Juliet,” “Saved By The Bell,” and his tribute to a deceased DJ friend, “Alan Freeman Days,” with a number of classic Bee Gees tunes from different periods of their career. While I have a couple of his solo albums tucked away somewhere in my music collection, this DVD is my first exposure to his solo voice in a live setting. While it may not be as strong as during the 1960s and 1970s, it is still a formidable instrument. He also wisely surrounds himself with a trio of female singers to provide harmonies, which are integral to the sound of many of these songs. Barry Gibb tended to be the vocal focal point on many of the band’s material. This was especially true during their disco period as his piercing falsetto would soar above the mix. Robin takes the songs in different directions as his normal voice is lower and its tone is different. This makes for unique interpretations of a number of well-known songs. The final result is different but pleasurable. The material from their first successful American period seems to work best. Songs such as “Massachusetts,” “To Love Somebody,” “I Started A Joke,” “I’ve Gotta Get A Message To You,” and “New York Mining Disaster 1941” benefit from the tempos being sped up, plus Robin’s voice fits the songs well. The best performance was “I Started A Joke” as he shows incredible range. The 1970s disco material is more hit or miss. “More Than A Woman” and “How Deep Is Your Love” are a bit too pop-oriented. “Tragedy,” “Night Fever,” and “Jive Talkin’” all fare better as his backing band and the orchestra really click, plus the female singers fill in the falsetto parts. Robin Gibb In Concert with The Danish National Concert Orchestra is a modernized trip back in time. He was an important part of one of the most commercially successful bands in rock history and here the music is brought to life according to Robin Gibb. Before the Bee Gees became superstars during the mid-1970’s disco era, they released a number of gentle pop hits, 1967-1973. Hits such as “Words,” “I’ve Gotta Get A Message To You,” and “To Love Somebody” all charted high in The United States. The Bee Gees released eight singles during 1967 and 1968 and only one did not reach the American top 20. The only release not to become a big hit was “Jumbo,” which stalled at number 57. I have always liked the song, even though it was an odd release and was very different from the rest of their material at the time. It was not a ballad nor a rocker. It did not have a memorable melody either. Still, I found it had an odd appeal. “Jumbo” remains a lost track in the vast Bee Gees catalogue. The pre-disco, pre-superstar Bee Gees were known for tight harmonies and ballads. 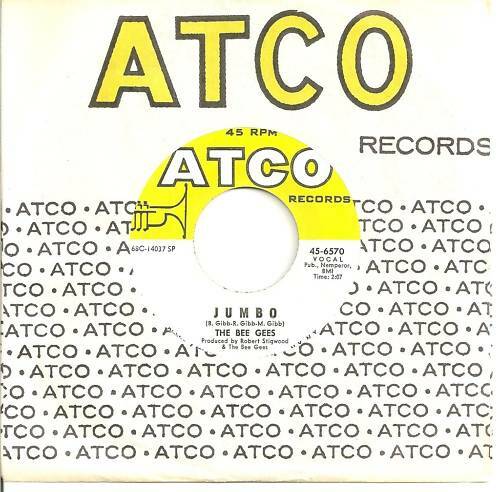 They released nine singles in The United States, 1967-1968, and eight made The American top 40. “(The Lights Went Out In) Massachusetts” was a wonderful ballad that reached number 11 on the BILLBOARD MAGAZINE Top 100 Pop Singles Chart. They had developed a unique sound and this 44 year old song is a good example of their style. This part of their career is often overlooked in favor of their string of mid-1970’s hits but is well worth exploring and in many ways contains the best music of their career. Before The Bee Gees became the kings of disco and went on to massive worldwide commercial success, they had a series of hits that were mostly ballads and mid-tempo songs that relied on their tight harmonies. 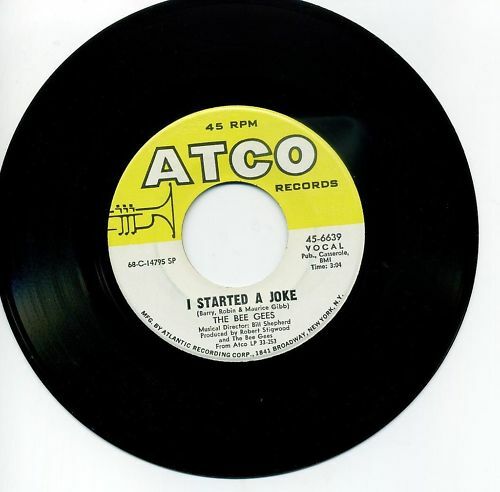 “I Started A Joke” was released December 21, 1968 and was their highest charting single of the 1960’s. It was a simple ballad that was catchy at the same time. While Barry, Robin, and Maurice Gibb would go on to stunning success and be inducted into The Rock And Roll Hall Of Fame in 1997, it is their series of releases, 1967-1972, that remain the heart and soul of their catalogue. The Bees Gees were at low ebb during early 1970’s. Their early career hits had run out and they had not gained their massive popularity from SATURDAY NIGHT FEVER and the advent of the disco era. They released the album CUCUMBER CASTLE, but Robin Gibb was nowhere to be found. Barry and Maurice carried on alone but the album quickly disappearred from the charts. It did contain one brilliant track which was released as a single in The United States. It only made it to number 94 on the American charts during March of 1970. I looked everywhere for this record but no luck until several decades later when I managed to find an old radio station copy. I did acquire a copy from Portugal with a sleeve which is pictured above. Alls well that ends well. You are currently browsing the archives for the Bee Gees Reviews category.